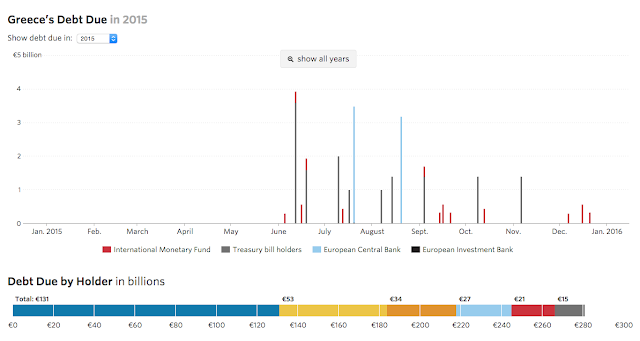 Via J. Cochrane ein paar aufschlussreiche Graphiken des WSJ zur Höhe des griechischen Schuldendienstes in den kommenden Jahren/Dekaden. Wenn also derzeit darüber verhandelt wird, ob Griechenland noch mehr Kredite von IWF und/oder ESFS bekommt, dann dienen diese nur dazu in der Vergangenheit ggü. dem IWF und der EZB eingegangenen Zahlungsverpflichtungen nachzukommen. Warum die ganze Verhandlerei aber trotzdem nicht vollkommen Sinnlos ist, darüber schreibt John Cochrane in seinem Beitrag, aus dem ich die Graphiken habe. "Why does the U.S. continually issue new debt to pay off the old debt? Why not just issue perpetual debt, which automatically rolls over? For the U.S., I couldn't come up with a decent reason. For Greece, there is a good reason. Yes, in the end, the IMF will most likely lend Greece the money to pay back the IMF. 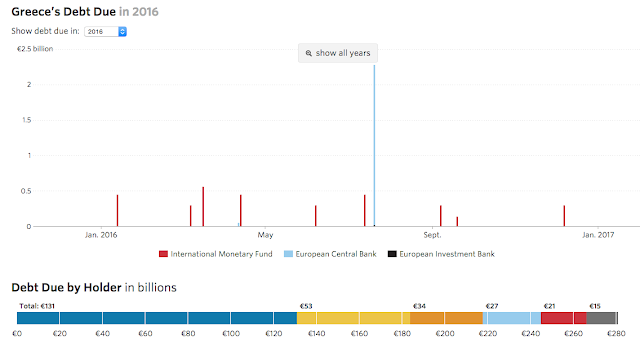 Or maybe the ECB will lend Greece the money to pay back the IMF. But both sides will renegotiate the terms. The IMF and Europe lent money to Greece with conditions that are politically painful, but that are be beneficial for Greece and for the chance of the money being paid back eventually, at least in the IMF and Europe's eyes. (I don't agree with all the conditions, especially tax increases, but the point here is the negotiation not the wisdom of the terms.) 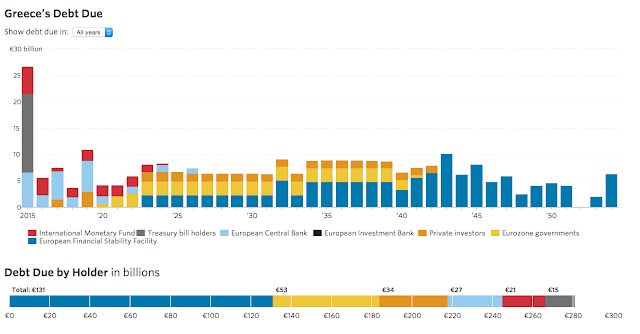 By lending for a year and then renegotiating, they can enforce that Greece actually follows through on the conditions. If you are going to lend money to a spendthrift relative you might want to do the same thing. Limit the time of help, and in a year we'll see if you're really cleaning up your act. But this is a two-sided renegotiation. They can only impose conditions if the costs to them of allowing a default are not too large. And Greece will only take the conditions if the costs of default to them are large. So it is to Greece's interest to make its default as painful to the rest of Europe as possible. Also by calling it a roll over, though, Greece had an interesting option -- if it didn't like "austerity," it could try other means of reviving their finances and paying off the debt. It's too late for that one. Doug Diamond and Raghu Rajan in a series of papers have been arguing that short-term debt allows lenders to monitor and discipline the borrowers. "Short" here can mean years, any debt that has to be rolled over a few times before being eventually paid off. This situation seems like a good instance of their theory."